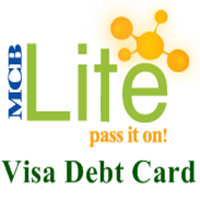 MCB Bank has announced its new Prepaid Visa Debit Card, MCB Lite. It is a payments solution, for those who don't have Credit Card or Debit Card, to enjoy services of VISA and to save money and time. There are neither monthly charges nor charges on making payments and transactions, however annual charges are applicable. You can deposit and withdraw money at any MCB Bank Branch, also withdraw money from ATM. MCB Lite can be used to purchase mobile air time, fund transfers, utility bills payment, pay money on POS stores, to withdraw money internationally and pay online. Bank account with MCB is not necessary to get this card. Click to see details about "UBL WIZ Prepaid Debit Card"
Following is details of charges. Joining fee is exempted for existing MCB customers. The Joining fee and the Annual fee will be automatically deducted from the First Deposit. You can apply for MCB Lite simply by visiting any of the Lite enabled MCB Branches, fill out the application form and deposit the permissible charges into your Lite wallet. Your relationship pack will be delivered to you after formal verification and approval, mostly within 7 working days. Now call the MCB Call Center (UAN: 111-000-622) from your registered phone number and set your Transaction / ATM PIN for your Lite Card through the IVR. Once your account is active, you can use it on any ATM machine or online. No interest or mark up. You can use it just like standard Visa Debit Card to withdraw money, transfer funds, pay at POS, shop online etc. You can store money in MCB Lite Wallet as per your needs. It functions as your bank account. You can withdraw money from MCB branches and any 1-Link/ M-Net and Visa powered ATM machines. There are limits on maximum balance, transaction amount and top-ups. You can transfer money to other MCB regular customers and Lite Card Holders. Money can be deposited in your Lite Wallet by visiting any MCB Bank Branch. MCB Lite also has its official android app named with MCB Lite Mobile Wallet on play store. This app is helpful as you can stay connected with your account on your own android phone. You can view your Wallet balance, view 10 recent transactions, send money to MCB Accounts and other Banks via IBFT, load money from your primary MCB account, pay bills and pay online payments. Koi faida nhi UBL wiz card ka jab bhi reload karwana ho. Toh har waqt inn ka system down hota hai. Reload branch saay karwana hota hai. Toh jab bhi branch mein jaun toh kehtay hein keh system down hai. MCB lite phr bhr iss saay behtar hai. UBL Wiz ka reload waqai mushkil hai. But its very easy if you have UBL account too. Simply use online banking to transfer to your wiz card. Recharging wiz was a pathetic experience until I opened account in UBL. in mein se kon sa best hai janab . Apna nam likho card name ki jaga jo name registered​ ha account kholte waqt.